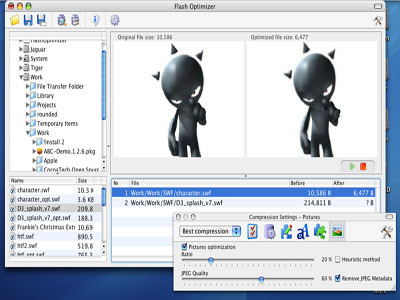 Optimize and compress Macromedia Flash files. Choosing predefined parameters of optimization, select any type of default compression settings from a drop-down list to apply its settings. To take advantage of batch compression add necessary flash files to the task list and optimize them all at once with a single click. In the task list you will see file sizes before and after optimization, which helps to balance between good quality of flash movies and their size when triggering compression settings. The main purpose of such optimization is to compress flash files with the least quality loss and optimize them for faster download. In web terms it is speed, interactivity, reliability and quality. Adjust compression settings for every single parameter of flash optimization to achieve highest optimization ratio. Save settings to access them quickly later for optimization of similarly structured flash files. So you can compress largest parts of flash files and cut down unnecessary elements. 'swf info' shows details on a flash movie structure, size of shapes, images, morphs, sounds, fonts and other elements that it contains before and after compression. This statistic gives important information which might help choose compression parameters for a specific flash file. Programs intellectual interface is easy-to use and provides fully customizable controls. Eltima flash optimizer for mac is very opportune and highly effective in use for multimedia designers, flash developers, web-designers, web-programmer, for professionals who use flash technology to deliver information, entertainment and unforgettable experience on the web and offline and for those who occasionally use flash, but are equally concerned about the size of output swf files of their work. Eltima Flash Optimizer for Mac OS is an utility that works under . Estimated download time for Eltima Flash Optimizer for Mac OS on a common adsl connection is less than a minute. 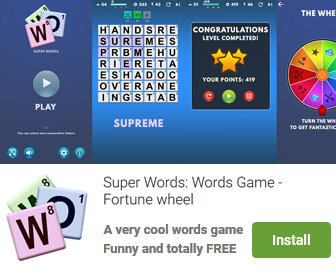 Version 2.4 was released three thousand one hundred sixty eight days ago by SWF Mac Software. Click the green download button to download it now.